SCUBA diving and snorkelling are renowned activities in the marine park. The mixing of tropical warm currents with cooler temperate waters makes the diving near Byron Bay unique. You can see and swim with both tropical species found on the Great Barrier Reef and animals from Australia's deep Southern Ocean. Julian Rocks: two small islands 2.5 km off the Byron Bay coast, is the park's most popular snorkel and dive spot with 19 spectacular and unique dive sites. Snorkellers typically explore the most protected and sheltered areas, such as the Nursery. The most regularly dived are Hugos Trench and the Northern Nursery, both good for beginners. Snorkellers can set off from Belongil Beach to find the wreck of the Wollongbar, which sank in a cyclone many years ago, and now emerges from the sea. The wreck of the Tassie II is also just offshore. Other dive sites include Spot X, Mackeral Boulder and the Cape Pinnacle. Conditions have to be good to dive Spot X and Mackeral Boulder as no shelter is available. The depth ranges from 18 to 26 m, making both sites great for large pelagic fish species. Spot X is a cluster of four large rocks arranged like a clover on the sandy bottom. 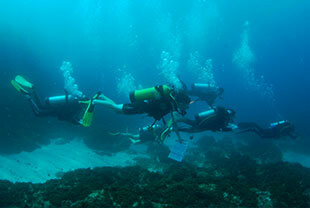 Cape Pinnacle is a deep site of greater than 40 m and suitable for deep certified divers only. The Moat/Bream Hole is an area of reef off the southern end of Seven Mile Beach, just north of Lennox Headland, which forms a unique oceanic lagoon. This site is excellent for snorkelling. Tour operators offer snorkelling and scuba diving tours and training most days. For more information visit Destination NSW. Julian Rocks has been declared critical habitat for grey nurse shark. Special rules apply when you snorkel and dive in this area designed to protect this endangered species of shark. What else can I do and see?